Once you become Archmagister, talk to Llunela Hleran in the Telvanni Council House Hermitage, and she’ll mention plans to build a vault and throne room in your tower. This will cost 5000 gold and the recruitment of guards, which will cost an additional 2000. You have to talk to Fast Eddie about recruiting guards before Llunela will begin construction. He’ll tell you he needs the Archmagister’s Seal to hire guards on your authority. This is the seal of office for the Telvanni, last in the possession of Archmagister Gothren. If you haven’t already, head to Tel Aruhn to recover the seal. It’s locked in a small chest on top of the wardrobe in the Gothren’s bedroom. This chest has a combination lock, which won’t work without a key. If you killed Gothren with Uvirith’s Legacy loaded, his key would have been on his corpse. If you missed it, there’s an alternative method to get the key by starting the quest “A Shift in Power” outlined in the next section. Once you have the seal, take it to Eddie and he’ll leave for a couple days to recruit guards. At this point, you have to pay Eddie the 7000 gold, which he’ll pass on to the recruitment office and builders. Make sure you ask him for the seal back once he returns. A week later, your vault will be complete. After becoming Archmagister, Eddie will inform you about some dissent among the ranks. Gothren’s (former) apprentice Garethi Nemas is hanging around Tel Aruhn stirring up trouble. In the Tel Aruhn upper tower you’ll find Garethi Nemas standing outside Gothren’s old throne room. Ask him first about “Gothren’s Key” of you didn’t get it from killing the Archmagister, and he’ll give it to you. Then speak with him about the “shift in power” and he’ll voice his grievance. If you send him on the quest, he’ll give you a nifty magical lamp. 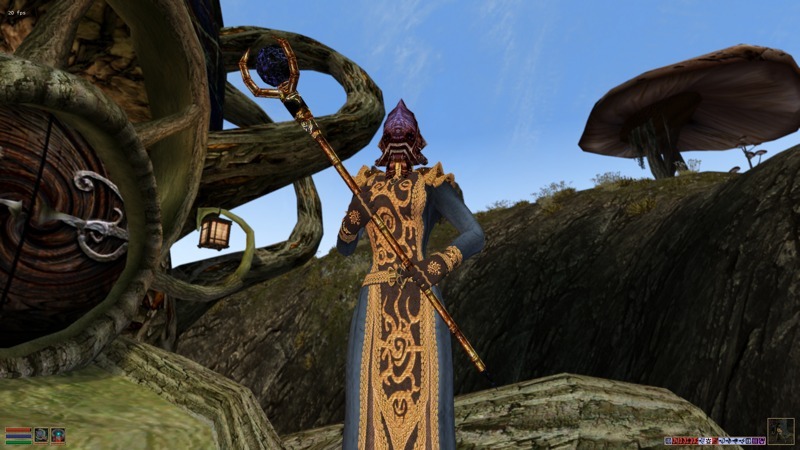 Talking to Mavon Drenim (or Garethi Nemas if you’ve posted him to Vivec) will start a quest to build a teleportation link to the Vivec Telvanni Canton. However, it seems the Council isn’t going to co-operate on this one, since the Vivec Telvanni are pariahs. You can start this quest any time, but won’t be able to complete it before becoming Archmagister. After that it’s easy – if you’re willing to pay for it. The Vivec teleport is located inside the Telvanni Tower hallway, the long one that goes all the way around, in an alcove opposite the entrance. It’s a stand with a crystal ball, like the Zharipel teleport, instead of the regular platform. The Sadrith Mora teleport is installed in the Council House Teleportation Chamber – it’s the crystal ball behind the platform. The Tel Uvirith teleport ball is installed in the upper tower behind the regular teleportation platform. After your vault is built, you can visit the new Library. Here your librarian Netheles Berom can sort all your books for you, and he also has a small quest. Netheles Berom wants a copy of the new Brown Book for the archives. He tells you Eddie has a copy waiting. Talk to Eddie about the “Brown Book” and he’ll give you a couple copies, which you can hand over to Netheles whenever you head back to the library. It lists you as the new Archmagister, and also mentions a few major issues the council have been recently dealing with. Eddie will tell you there’s mention of an urgent problem in the book – read it. You’ll need to talk to Arara Uvulas about it. After reading the new Brown Book, Arara Uvulas will tell you about Zhariphel, a secret bloat mine maintained by the Telvanni. It’s been beset by shalk attacks, and the miners require aid. The mine is located deep in Molag Amur, southwest of Tel Uvirith and due west of Galom Daeus. The entrance lies on the north face of the mountain at the end of a twisted path. Arara Uvulas will give you the key to the mine and a map. The workers and guards in the mine will challenge you when you first enter. With the Seal of the Archmagister, or the key Arara gave you, you can establish your credentials, and you’ll be free to walk around. Once you enter the mine, take the door to the right and head into the mine itself. Head up the rock path to the left and onto the wooden platform where you will find Barusa Galdin, the “bloatmaster.” Master Galdin will tell you all about the shalk problem. Shalks have been crawling from the deep tunnels in waves, invading the bloatmine and devastating the crops. Galdin has a book that mentions a “shalk king” and believes a giant shalk has taken residence down there. Two guards have been killed in the deep tunnels while attempting to clear out their nest. You’ll need to venture into the deep tunnels and kill the shalk king. The Deep Tunnels are through the door to the left of the platform. You’ll need a good night-eye spell or torches to see down there. Head down the shalk-infested tunnels until you reach the gaping pit at the end. The shalk king is perched on a large rock on the other side, which you need to jump or levitate to reach, and it has a ranged attack. The pit below is completely filled with shalks, so be careful. If you talk to Eddie about the “urgent problem” after taking care of it, he’ll give you a copy of Barusa Galdin’s book on Bloatspore Cultivation, which he finally manages to finish after the shalk crisis is over. In the accompanying note, you’ll find a ring that teleports you to Zhariphel. You can also get the ring from Arara Uvulas. Feel free to explore the town of Zhariphel, a collection of underground Telvanni housepods. The town is entered through the door to the left as you enter the mine. There’s a small side quest to help an injured slave in the warren’s slave house. There are also many notes strewn around the place that tell some some of Zhariphel’s story. After completing the first Zhariphel Mine quest, you have to return to Eddie to pick up this next quest. Once you return to Zhariphel, Master Galdin will ask you to help them build a new council house in the Zhariphel warrens. Your first task is to try to convince Master Neloth to help fund the project. You’ll be lucky to get half, and may end up having to front the entire cost yourself depending on how the conversation goes. The build will require 2500 gold. After talking to Master Neloth, visit Llunela Hleran in the Telvanni Council House Hermitage. After paying her to grow some new pod-spores, it will take about a week before you can claim them. Take the podspores (all of them) to Master Galdin, and he’ll start growing a new underground housepod. You can even watch it grow from week to week. It will take about three weeks before you can enter the new building. The new Council House is empty at first. Talk to Berinna Valys about furnishing it. She needs 1000 gold to bring in supplies. If you decide to give her the money, it will take her about a week to put everything together, after which the new council house will be furnished and renamed in your honor. After the council house is built and furnished, Gyladis Arven will tell you about her missing son Darys. Gyladis tells you Darys was last seen in Vos, but disappeared almost a year ago. If talk to the Vos locals, they might have a clue. Yakin Bael will tell you Darys ran off to join the Ashlanders after his wife died. You’ll have to ask around the nearest Ashlander camps. He was last seen by Yakin traveling south. With Darys problem taken care of, he’ll agree to meet his mother. Return to Gyladis and tell her. She’ll leave for about a week and return with him. He’ll become the new publican for the Zhariphel Council House, and supply you with NoM compatible meals and other supplies. Gyladis will also give you a new travel ring that will take you directly to the council house entry. It’s also better looking than the old one.